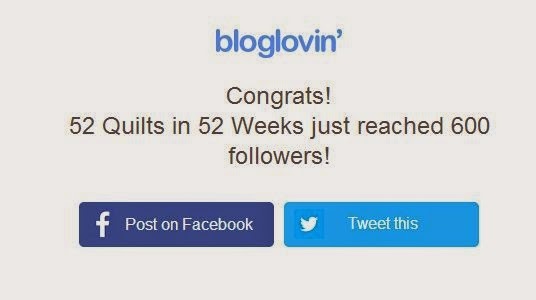 I received an exciting email from the fine folks at Bloglovin' this morning -- 52 Quilts has reached the 600 followers milestone! Now, I know not everyone follows 52 Quilts via Bloglovin. Friend Connect on Google+, email, Facebook, Instagram -- if I add them all up, the number is more like 1300+. However, today we are celebrating the "official" Bloglovin' number. 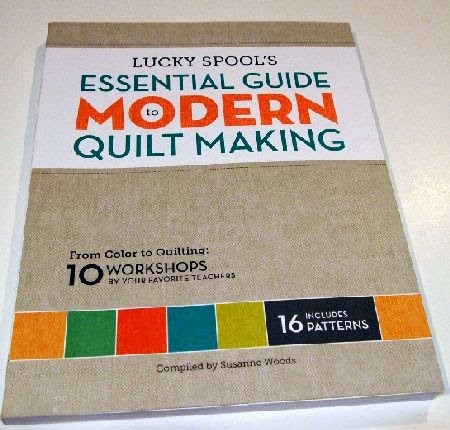 I've been hoarding this copy of Lucky Spool's Essential Guide to Modern Quilt Making just for the next "big" giveaway on 52 Quilts. Giveaway ends August 28 at midnight MDT. Thanks for following 52 Quilts! Woo hoo! I love modern quilts! Congrats on the big milestone! And thanks for a great give-away. I have made something that may be considered a modern quilt but I think the definition is a bit confusing. I would classify myself as more of a traditional quilter. Congratulations! I follow you on Facebook. I took your challenge to make 12 quilts in 14. I just finished #12 in early August. These were from start to finish. Along the way I quilted a few more. Quilts 13, 14 & 15 are ready to be quilted! Thank you for the push! Thanks, Julie! You come through as a no-reply commenter, so if you send me a PM at AuntMarti at 52Quilts dot com, I'll add you to my address list. Just in case you win the giveaway! Oh yes, I have transitioned to making mostly modern quilts. Congrats on the milestone! I make quilts from my head, improvised, in solids and prints. Congratulations! My first quilt was pretty modern, but that was before I was "quilting." It was even before the internet really took off. I have done contemporary quilting while learning the ropes, and I'm making my first modern improv quilt right now! Congratulations! That's amazing. 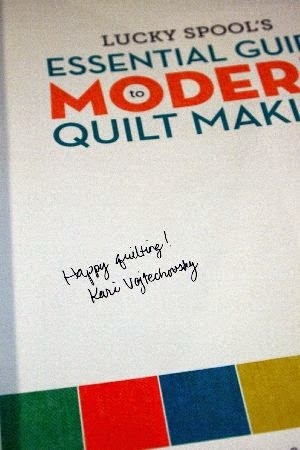 I would love to get this great book, because I love modern quilting. Thanks, Rike -- and I love the little bags I see on your page! You come through as a no-reply commenter, so if you send me a PM at AuntMarti at 52Quilts dot com, I'll add you to my address list. Just in case you win the giveaway! Yes, I have made modern quilts...At least I considered those modern . Though undoubtedly I need to improve the skills..
Marina, thanks for commenting. It's always fun to "fine tune" our skills! You come through as a no-reply commenter, so if you send me a PM at AuntMarti at 52Quilts dot com, I'll add you to my address list. Just in case you win the giveaway! Congrats!!! I have made a couple I consider Modern, but the term is used to cover so many different things, sometimes I'm just not sure. I have not - but I hope to someday! Thanks, Pamela. You come through as a no-reply commenter, so if you send me a PM at AuntMarti at 52Quilts dot com, I'll add you to my address list. Just in case you win the giveaway! Congrats! I love modern quilting too. Congratulations! That's a LOT of followers! I'm not sure I've made anything that would truly be called modern, but I love them! I think that I have made a few, but they were made before anyone coined the phrase, "modern quilt!" I do not aim for modern, or traditional, or vintage these days. I just let the fabric suggest where it is going. CONGRATS on 600 blog lovin' followers! Wonderful! I have made many quilts that I would call "modern" although that term seems somewhat loosely defined. And I love many of the modern fabrics. Congrats on your milestone! I love modern quilts but I haven't made one yet!! Woo! Look at you go! Yes I think I have! I find Modern hard to define, but I believe I have made a couple of modern quilts. I don't know. I have done a couple of ones with a lot of white space, but I use modern fabrics pretty much all the time. Congratulations! 600 is a big number! I can't possibly keep up with you but I'll have fun trying. I THINK I've made a modern quilt. I use big, over scale designs a lot, so I'll say that's "modern." Right? Congratulations on your 600 Bloglovin' followers! I think I'm mostly a modern quilter. My last quilt finish is here. Well I dont make shabby chic, reproduction..maybe sometime tradiotanl but with brigether colours - I'd say "modern"
Well done on such a large fan base!! No, I have never made a modern quilt yet. All I've done so far are modern quilts' however I love the traditional patterns just freshened up with modern color palettes and collections. I think I'm in between traditional and modern....I am working towards Modern though with my recent quilting. Like OhioLori, I'm a "Blend"! Congratulations ! Yes I love to work both traditional & modern way. I think so. The definition of modern is a little shakey for me, but the quilts I've made have used bright, modern fabrics, with plenty of neutrals and machine quilting.. I think that's modern. Congratulations on the followers! If you log into Feedly you can see how many followers you have there too. Sooooo excited for you! Congratulations. Yes, I'd love to have this book. Yes, I have made "modern" quilts, and I design them too and have just started selling patterns. The baby quilt I made for my niece is more modern--I really tried to emphasize the graphic design on it. I am more of a traditional quilter, though. Congratulations! Yes, I've made more than one modern quilt! I *hate* fru-fru quilts, so finding more contemporary looking ones always makes my day and gives me ideas on where to go next! I haven't really made a modern quilt before. Congrats on the followers! This book looks really interesting and congrats congrats on the awesome news! I think I have made a modern quilt - according to my thinking anyway! I've been wanting this book! :) What a nice giveaway. Thanks, Kimber. You come through as a no-reply commenter, so if you send me a PM at AuntMarti at 52Quilts dot com, I'll add you to my address list. Just in case you win the giveaway! Thanks for commenting, Di -- You come through as a no-reply commenter, so if you send me a PM at AuntMarti at 52Quilts dot com, I'll add you to my address list. Just in case you win the giveaway! I have not made a modern quilt. But, I do think it is time for me to make one. My children have requested modern quilts. I haven't totally converted. Thanks for the giveaway. Congratulations on 600! I enjoy your blog. Congrats on 600 Bloglovers!! I don't think I've made a modern quilt, but I plan to! Congrats! I made a baby quilt once which I'd say looked pretty modern. It had appliqued birds and houses on it. I was a bit sad giving it away! Congrats on hitting a major milestone! I am a new quilter, and have pretty much stuck with traditional patterns, but I'm getting braver about trying new things. I've made a few modern quilts, although I don't tend to like to put my quilts into any particular category, I just make what I feel like, traditional, modern whatever! Yes. I have made one and I am working on another. The first is a giant pair of black scissors with a low volume background. It measures 60 x 60, and has about 1000 2-1/2" squares. Sew fun. I have never made a modern quilt. I tend to lean towards civil war fabric. I need to get out of my comfort zone. Congratulations on 600 BlogLovin followers! Yes, I made one modern baby quilt. Congratulations! That is a lot of folks. Congratulations on 600 followers. I am one of them! And I came from there, so you know it works. Have I made a modern quilt? Well, I've tried, but then I wound up adding embroidery. I couldn't leave well enough alone. I tend to mix up styles so I use traditional fabrics with modern quilts and vice versa. I don't think I have one that someone would clearly identify as modern. I have not made a modern quilt yet, but I would love to do so! Yes I would like to think I have made a modern quilt. I have also made a few mini quilts in a 'modern' style. :) And woohoo - congrats on the big 600!! That is amazing! Woohoo!!! Congratulations. I find myself more and more drawn to the modern quilts. I have never made a modern quilt. I would love to try! Yes I have made a modern quilt! Love the look! Congrats! I only make modern quilts. Yes, I have made 2 modern baby quilts and it was hard to give them away! I'm working on a modern wall quilt for myself at the moment and can hardly wait to finish. Thanks for the giveaway! just finished my first modern quilt. love 'em. Thanks for commenting. You come through as a no-reply commenter, so if you send me a PM at AuntMarti at 52Quilts dot com, I'll add you to my address list. Just in case you win the giveaway! I don't believe that I have made a modern quilt but I have posted many from Pinterest that have inspired me!!! Congrats on all your followers that is awesome!!! I have! An improv quilt. And I loved it! I have made my first modern quilt and really enjoyed the whole process. I think I have made a modern quilt - five wide bands of fabric sewn together and bound to make a baby quilt. I like the empty space and plan on making a flying geese modern quilt. I enjoy your posts. Congratulations on reaching the 600 mark. I have not made a modern quilt, yet! It is on my to-do list. Congrats on your landmark achievement. I don't think I've technically made a modern quilt but it was to me. I freestyle, appliqued lollipops and flowers. So fun! Thanks for the giveaway! I have just recently started making modern quilts. I love low volume quilts! Thanks for the chance to win! Great news on the followers. I would love to win this book. I am trying to collect great books for our guild library and this would be wonderful. Yes I have made modern quilts including minis. I am working on a couple of modern minis to donate to the National Quilt Museum fundraiser. Congrats on reaching your 600 followers. I haven't, but I think I should try to! And I now follow on bloglovin. I quilt modern and traditional sometimes combining the two. It depends who I give the quilt to. I dont think I have made a modern quilt,, but am about to,, and its going to be a baby gift,, but it fits the mom to a T! They are the only kind I make. Congrats on 600 "official" bloglovin' followers! I have made a couple baby quilts with modern blocks. LOL I seem to be stuck mostly in the civil war era. I've only made "modern" quilts! Congrats on your milestone! The vast majority of my quilts are modern. Thanks for the chance to win! I haven't but I covet them all the time. No, I haven't sewn a modern quilt yet. Congrats! I have not but would love to try! Have been following for years via google but am not changing over to Bloglovin. Just makes more sense :-). I'd love to win your fabulous fabrics/patterns and book. You always have something fun to try on your blog. Congratulations to your achievement!! I do like to sew modern quilts, I go back and forth depending on the person that will receive it. Thanks for the chance. Follow you email, bloglovin and pinterest. I've made I guess what could be called modern wall hangings. Congrats on reaching 600 with Bloglovin. I'm using Feedly at this time, but have Bloglovin set up with lots of blogs being followed, so yours is probably one of them. I've made one modern quilt waiting to be quilted, truth be told I've stalled on the quilting but think I've finally settled on the motif I want to use. I follow with Blogger, thank you for offering this giveaway! Congrats on the following. Thanks for the give away-love books and congrats on 600 Bloglovin-ites, of which I am one. I love modern quilts. I never use a pattern or a single line of fabric. I design my own quilts and often am deep into the project before the end result reveals itself. Congrats on 600 followers and thanks for the lovely giveaway! I don't think I have. My quilts are traditional but made with brigh, modern fabrics. Does that count as modern? Congratulations on the milestone. I like modern quilts as well as traditional and make whatever takes my fancy! I've made a couple modern looking quilts. Thanks for the giveaway. I've been enjoying your blog for some time now...via bloglovin! Congrats on 600! Just shows we all appreciate your sharing your talent! Not even sure what a "modern" quilt refers to! So Maybe I have, maybe I haven't.. I don't know! I have definitely made a modern quilt! love the cover of the book. it make me just want to open it and explore all it has to offer. Lisa, I'll tell the authors what you said, they will be pleased! This time I'll answer the question! I have never made a "modern" quilt, to be used on a bed, but I am experimenting on smaller projects. Congratulations and thanks for the generous give away. I love the freshness of "modern" and I think I would learn a lot from this book. I love modern quilts. I would love to explore your tecnique. Love to learn more about modern quilts! I make charity baby quilts+they are usually of a traditional pattern>but I think I'd like to try a really modern pattern for one! Thanks for sharing! Not completely one or the other thing but a combo of modern and traditional! No I have not but I find them very artistic. I have never made a modern quilt but do want to try to make one! Oh yes! t the moment my favourite one is the Zakka Block one I made using dyed black linen as the background fabric. I have only ever completed one quilt, but I am always starting new ones:) Would love to win this book and get started on some modern style ones!! I mostly make traditional patterns but am really enjoying the spin to modern quilts. A lot of what i notice is traditional patterns with the fabrics being modern and the quilting too!